For how much can I blame allergy symptoms? A neighbor mentioned that Dee and Dee was closing up shot at the 5th Avenue and 50th location due to a (possibly) lost lease. I thought that I hadn't noticed this the last time I was on 5th, but when I strolled by today, I realized that I had noticed it, but it hadn't registered in my pollen soaked head. Oh well. At least some of the more official looking signs are new since I last walked by. 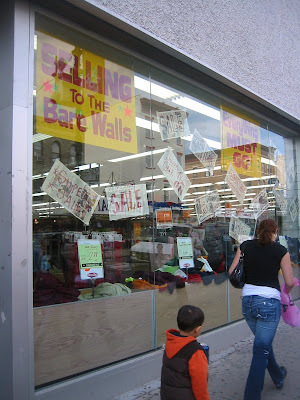 Selling to the Bare Walls certainly sounds ominous. Lucky for bargain hunters, you can just continue on the B63 going north or south and you'll find a Dee and Dee. My neighbor also wondered what the heck is going to go into this huge space. A whole lot of nothing for a while if the corner of 5th and 45th has anything to say about it. That was empty for a long, long time. Am I the only one who did not know you could get Junior Mints at Dee and Dee? Pop a box into the freezer and you're set for summer. This is such a loss! Dee & Dee was the best place for stocking stuffer, side birthday gifts, and housewares. Well, at least Mini Max is still here (for now). Shocking!! I remember when it was only a small store location before expanding to the current size. Your neighbor friend here Emily, love those Junior Mints, going to miss them. Dee & Dee own all the buildings they have their retail stores in. When the father of this family owned business died, his sons no longer desired to be in retail, this desire being further exacerbated by the current economic climate. Word is Staples is the leading candidate for the store. Staples is a possibility, huh? Well, at least they sell candy there, too. Their sales on stationary also can be pretty darn good as well. The question is, will this Staples allow strollers, or will there be stroller parking in the front? Things will be rough round our house without the Junior Mints!